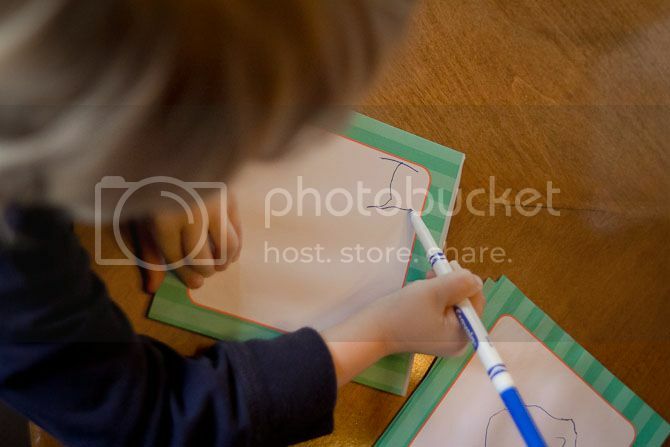 He all of the sudden, without my prompting, decided to draw pictures for all his friends. 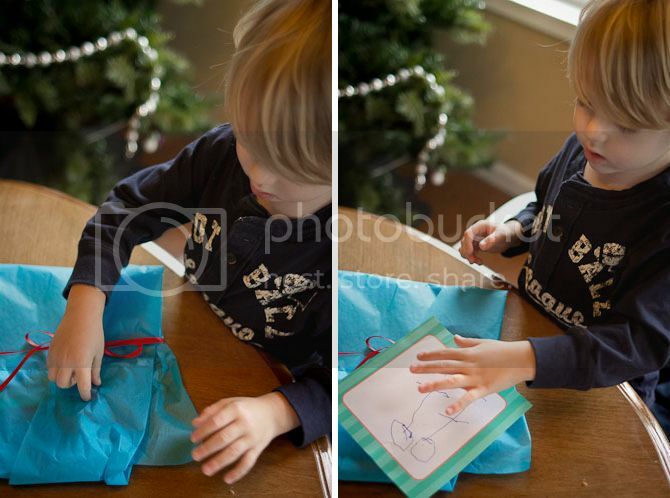 It was so interesting to watch his process--he had a very precise plan for these gifts. 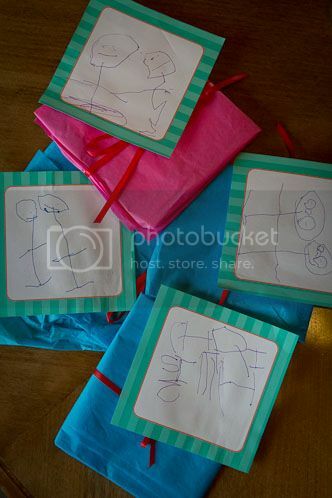 He drew everyone a bunch of pictures and chose ONE to stick on the front of every gift. All of the sets of pictures include a drawing of a "pipe", a picture of him and his friend holding hands, and maybe their name if we are lucky. 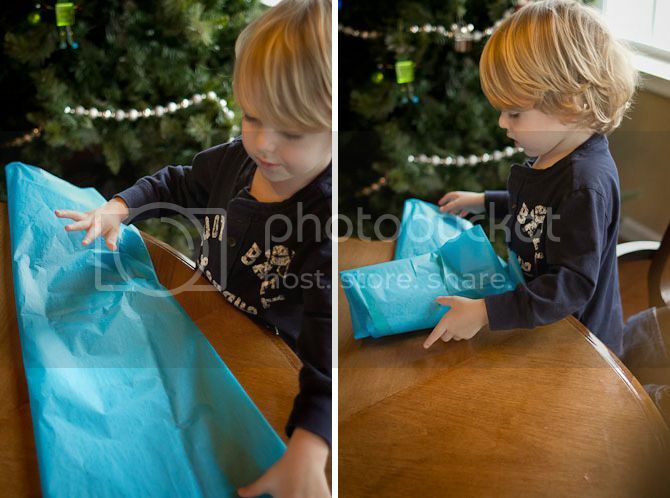 He wanted them wrapped up very specifically--in paper, with a bow and tape. It was sweet. That bottom one says Christmas, in case you can't read three year old writing. I hope that I can find as much joy in gift giving as this little guy does! I really think he can't look at the camera. Like he just can't. Also, these are cute. He really can't. 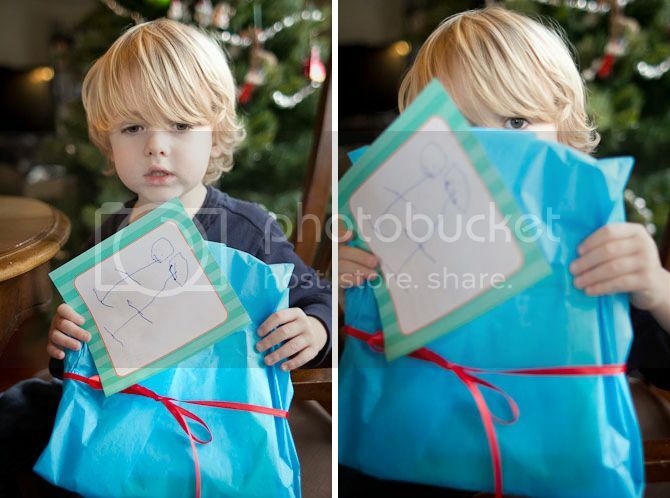 I think we are going to have to get him photography therapy, I think he just doesn't realize what his face is doing. Very sweet Rachel. It is wonderful to see the world through the eyes of a child. Thanks for sharing. The stick buddies are precious!! I think he hates the camera. On another note, I'm really enjoying your attention to "detail shots", Rach!! When Finley does really cute things like this, I find myself wanting to take credit for it even though I live 2,500 miles away and have no influence on this behavior. Is that weird? I love you Finley!!!! That is about as sweet as it gets. Have a very Merry Christmas!